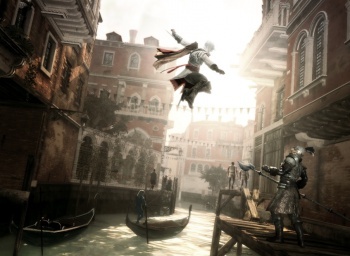 PC gamers can finally get their hands on Renaissance man Ezio in the stellar Assassin's Creed II come this March. Assassin's Creed II was a smashing success when it hit Xbox 360 and PS3 back in November, but poor PC gamers have had to sit on their hands and wait (or just play Torchlight or something) for the game to come to their gaming platform of choice. Well, PC gamers, wait no longer! Er, wait a bit longer, but now you'll know just how long you'll have to wait. AssCreed 2 will be finally leaping from the console tower down into the PC haystack (no, that wasn't intended as an analogy to disparage PCs; put your torches and pitchforks away please) on March 16th. As with Activision's Modern Warfare 2, AC2's PC version will be priced at the console standard of $59.99 instead of the usual PC price of $49.99, but it's actually not quite as bad as you might think - seriously guys, you can put the pitchforks down again, really. The PC port will be a so-called "Director's Cut" of the game, coming with the Battle of Forli and Bonfire of the Vanities DLC packs that console owners had to buy separately - so while it's the same price as a console game, you're still getting more content for your money. There will also be a "Black Edition" version of the game that will be digital-distribution only; this Black Edition will go for $64.99 and have further additional content that has yet to be announced. And finally, here are the specs you'll need to make it run oh-so-prettily on your 22" widescreen LCD.